Article: Does WorkTech in India have a promising future? Does WorkTech in India have a promising future? 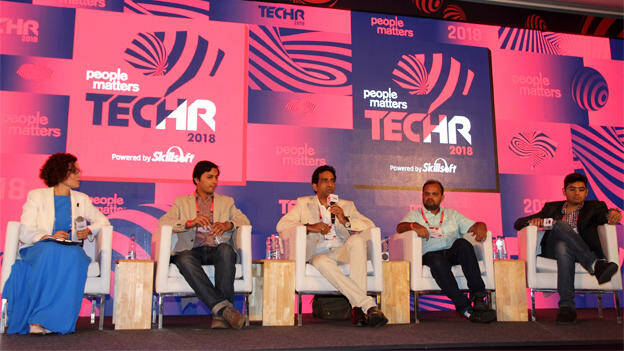 In a session at Tech HR 2018, investors gave their perspective on the biggest problems yet to be solved and the promising future of WorkTech in India. What are the big problems in the work? Where are corporates struggling? What are these areas which can become opportunities for WorkTech, both for buyers in the HR space as well as for startup entrepreneurs? These are some of the questions which a bevy of investors aimed to address in a panel discussion on day two of Tech HR 2018. The panel comprised of Arpit Agarwal, Principal Partner, Blume Ventures; Rajul Garg, Founder and Managing Partner, Leo Capital India; Tarun Davda, Managing Director, Matrix Partners; Sandeep Sinha, Managing Partner, Lumis Partners and was moderated by Ester Martinez, CEO and Editor-in-Chief, People Matters. Kicking off the discussion, Arpit stated that in early stage companies, the most important part of HR is recruitment. Both investors and founders end up spending inordinately a lot of time and resources doing recruitment. Hence recruitment as a challenge is not going away. What is also underappreciated and under-invested is training and performance management as these functions are more structured in the enterprise scenario. Another exciting yet challenging trend is that of the gig economy-as companies are still navigating their ways to figure it out. Sandeep concurred that while recruitment opportunities are huge, but the challenge is that HR Tech companies have not even scratched the surface. There are opportunities in every single spectrum of HR. For instance, most of us don’t look at the world of contingent staffing with a lot of appreciation with the challenge being of low margins and a huge taxing workforce. Yet Quess was able to create a $2 Bn market cap company in that domain. The panel concurred that the nature of work in India has already started to change fast and HR companies are struggling to deliver that. We are seeing new age adaptive learning organizations in India. We are seeing recruitment moving to a process based RPO kind of setup. Hence there is an opportunity to be unleashed in the coming years. Why so few HR Tech companies been able to scale? Despite the huge opportunity in HR Tech, the fact remains that very few companies have been able to scale. What explains this conundrum? As per Rajul, HR is a part of the supply chain. Larger businesses are increasingly under pressure. They want people to be productive, it’s super competitive- and that pressure translates to HR and people. And India, in spite of everything going on, is still an employer’s market. So you have an inherent conflict-you want sort of good for the people, and you also want automation to improve productivity for the business. It’s not an easy problem to solve-it happens rarely, only once in a while you put it all together and everyone wins, and that is when it takes off on a big scale. Who is best poised to take advantage of this opportunity in WorkTech? Given that we are at an influx of opportunity in the HR Tech space in the country, who is best poised to leverage this opportunity? As per Tarun, it is most likely to be an experiential entrepreneur- someone who has an appreciation and understanding of the problem or has faced or experienced the problem first hand. This is because he believes that selling to enterprises is hard unless you have been in the system for some time. While the market is still employer-driven except in tech, there is a shift in the market at least when it comes to the new age companies where it is moving from employer-driven recruitment to candidate driven recruitment. And there are companies that are coming up that understand this trend. If companies don’t understand the nuances of improving their employability, it is hard for someone to do it from outside. So while some of these subtle changes are happening, but when you are selling to enterprises, you need an understanding of the problem. More so, for anyone looking to take advantage of this opportunity, there is no alternative but to execute. You have to out-execute faster and better. Ideas will keep coming but they don’t matter alone. For most of the investors, it is execution and the path that you take towards execution that matters. Is there an opportunity for an Indian home-grown HR Tech company? In conclusion, the panel averred that the overall Indian SaaS enterprise ecosystem is extremely nascent. While it may take years for companies in the HR Tech space to go global, the seeds of them have been sown. One such example is People Strong, where the company has grown into market-leading tech enterprise and investors too have seen a fabulous exit. What will facilitate the emergence of such a global HR Tech player is the HR community trying new products, evangelizing, and supporting new startups to foster and further the promise of WorkTech.